Malak Marketplace Top 10 Farmers Market in Australia! 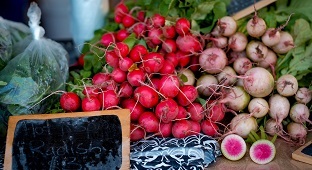 We’ve just been named one of Australia’s Top Ten Best Farmer’s Markets by Qantas Travel Insider! In Darwin, they keep it seasonal as a matter of necessity – it wouldn’t do to have your stallholders and shoppers washed away in the wet season. But if you’re around during the dry, stop in at Malak Marketplace. The tastes of the Top End come alive at the twilight open-air market, where stalls display a Frond Rating to indicate their commitment to sustainable and organic practices. Aside from fresh produce and local crafts, the sizzling street food is the major drawcard. The central gathering area, with plenty of table seating and brightly coloured umbrellas, is the place to sample fare from Indonesia, Thailand, France, Argentina, Syria and beyond. Visit the website for news of market tours, yoga sessions and cookery classes.